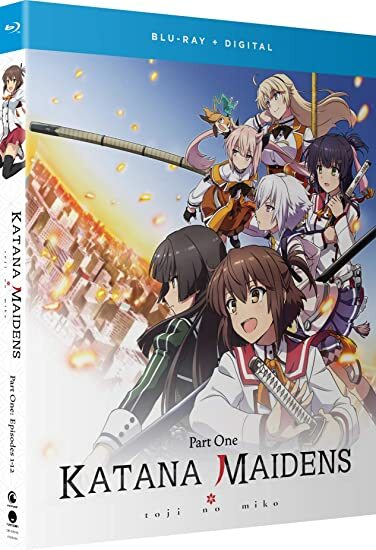 Katana Maidens: Toji No Miko - Part One - BUY THIS BLU-RAY! Protecting the world from supernatural beings has been the task of shrine maidens for centuries. Now, under special authorization of the government, these uniform-wearing, sword-wielding girls spend their days honing their skills at five special schools throughout the country. Among the many who attend, only the strongest can become champions at the annual tournament! THEN SEND IN A COMMENT ABOUT YOUR FAVORITE FUNIMATION TITLE (you may click on artwork above for a refresher) PLUS YOUR NAME AND ADDRESS TO contests@efilmcritic.com or WeLoveHBS@aol.com. (Just one e-mail please.) Put [b]"TOJI YES MIKO" in the subject line and cross your fingers. We will draw names and one of the prizes could be yours. Only 1 entry per household.